The usual argument against unilateral U.S. effort to cut greenhouse gas emissions and reduce climate change is that we’d impose significant costs on ourselves, with most benefits going to other countries. Thus, we should wait for an international agreement. By the way, an international agreement is not going to happen. Meanwhile we wait, which means more global warming, sea level rise, and increased extreme weather events like floods, droughts, and hurricanes. That argument may also include the claim that U.S. agricultural productivity might increase from a little global warming, and the U.S. is rich enough to protect itself against sea level rise. According to that logic, we can’t worry too much about damages to other countries, as we can’t take care of the whole world by ourselves. The problem with that logic is that those costs to other countries will unavoidably become costs on us! Take two examples. First, a Reuters article points out that “a third of Bangladesh’s coastline could be flooded if the sea rises one meter in the next 50 years, creating an additional 20 million Bangladeshis displaced from their homes and farms.” Some large percentage of the nation could disappear under water. And that’s only one such nation. Global warming and sea level rise could displace hundreds of millions of poor people. The U.S. will find itself unable to turn its back on such a disaster, for humanitarian reasons. Moreover, the costs would come back to haunt us in other ways, through increased wars and other political disruptions of great danger to the U.S. itself. 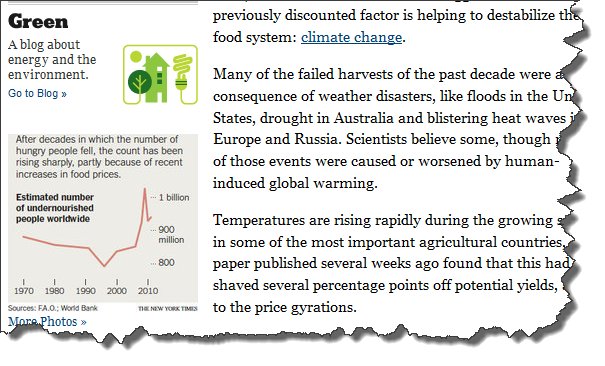 A second example appears in a recent NY Times article about the effects of global warming on agricultural productivity. It starts by describing terrific recent technological advances: “Forty years ago, a third of the population in the developing world was undernourished. By the tail end of the Green Revolution, in the mid-1990s, the share had fallen below 20 percent, and the absolute number of hungry people dipped below 800 million for the first time in modern history.” But those technological advances have leveled off, while growing demands have reflected huge growth in worldwide population and incomes. The resulting grain price spikes have contributed to the largest increases in world hunger in decades, perhaps 925 million last year (see screen-shot). Suppose the U.S. is only to look out only for itself. Forget altruism. Forget unilateral efforts to save the world. Wouldn’t we merely be protecting ourselves by doing something now to reduce worldwide political instability that could result from a hundred million refugees and famines of that magnitude? Tagged Under : cap and trade, carbon policy, carbon tax, CBO, climate change, cost benefit analysis, Environmental Policy, global warming, government, greenhouse gases, regulation, U.S.